I imagine there must be something out there. All I want is a simple script or app that keeps running track of my investments compared against my portfolio allocations. I don't know how others do it, but I keep track of everything on google finance - every time I buy more index shares etc. I enter the transaction into there. Every couple of months I laboriously transfer the current balances into an excel sheet and compare it with my allocation percentages to decide what to put my next rounds of savings into. The reason I do this is because our investments are in different accounts, not all of which can be moved (at least not easily). For FIRE tracking purposes I also combine my wife's investments with my own - so our individual portfolios are only a part of the whole, and I can combine them in Google Finance. I'd love to have a simple script that just tracks the day to day valuations, compares them to my allocations and tells me what to buy (I basically follow one of the Cdn. Couch Potato portfolios). But I throw some cash in there as much as twice a week (I use Questrade, which allows ETF purchases with no commission, so there is no reason not to just index immediately with every paycheck). Dividends get reinvested whenever I buy as well - growing the snowball. Ultimately it won't make a hell of a lot of difference, but since this is a game of small edges I see no reason not to make the (hopefully) most optimal decision I can with every little micro-investment. So does anyone have or use some kind of script that help with this? 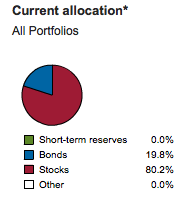 Re: Anyone know of a script or app for portfolio balancing? Excel can be linked to quotes. I imagine google docs can do the same. Which is perfect, because it stays up to date with market fluctuations, but I have to update it manually every time I add new money to my outside investments (like my 401k), and I still have to calculate how much of the new contributions I should put towards each fund to stay at my 80/20 level (same problem with Personal Capital). I'm also not sure if they assume the outside investments are reinvesting dividends. You could use Quicken. 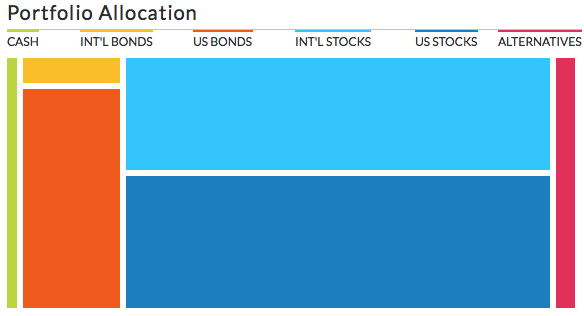 See comments in http://forum.mrmoneymustache.com/investor-alley/need-easier-way-to-examine-asset-allocation/. Hmm, I don't have an account with Vanguard - I just own some of their indexing ETFs (VUN, VCN, VAB). I'm not sure if I can get an account with them here in Canada. I have had bad experiences with Quicken where I have to go back and recategorize my expenses all the time. Frustrating enough that I won't use that produce anymore. This is interesting. I think I'll noodle around and see if someone has created an excel template that does something like this. Worst case I'll do it myself. Check out the extension I linked to in my post. I'm using quotes to auto-update the current value of my portfolio. Dodge, would you mind sharing that spreadsheet? You can remove any personal info, of course.